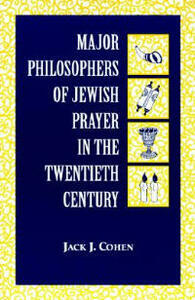 Major Philosophers of Jewish Prayer in the Twentieth Century addresses the troubling questions posed by the modern Jewish worshiper, including such obstacles to prayer as the inability to concentrate on the words and meanings of formal liturgy, the paucity of emotional involvement, the lack of theological conviction, the anthropomorphic and particularly the masculine emphasis of prayer nomenclature, and other matters. In assessing these difficultites, Cohen brings to the reader the writings on prayer of some seminal 20th century Jewish theologians. These include Herman Cohen, Franz Rosenzweig, Avraham Yitzhak, Hoakohen Kook, Mordecai M. Kaplan, R. Arele, Aaron Rote, Elie Munk, Abraham J. Heschel, Jakob J. Petuchowski, Eugene B. Borowitz, and Lawrence A. Hoffman.